April 19, 2019, 8:43 a.m.
April 17, 2019, 9:53 a.m. Some very good news out of Washington D.C. on Thursday! 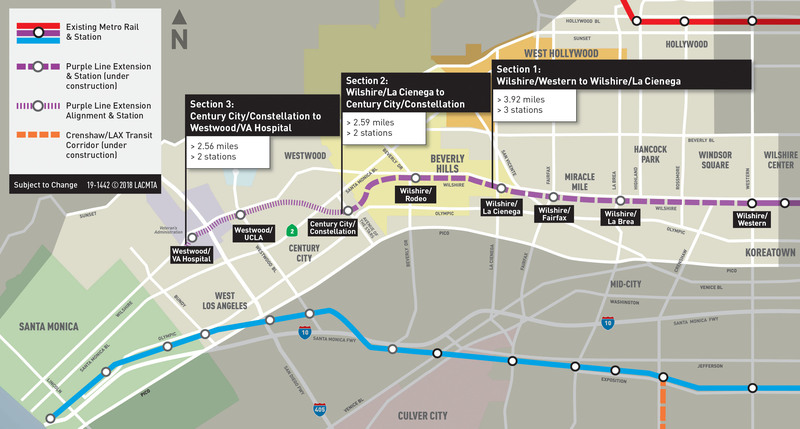 The Federal Transit Administration has approved Metro’s request for a Letter of No Prejudice for the Purple Line Extension’s Section 3 between Century City and Westwood. In English, that means that Metro can proceed with a contract it awarded earlier this year to construct stations, trackwork, systems, testing and related activities for Section 3. Some background: Metro and the FTA are finalizing a $1.3-billion federal grant (officially known as a Full Funding Grant Agreement or FFGA) for Section 3 of the Purple Line Extension. That money will be combined with local funds from Measures R and M to build Section 3, which has an estimated cost of $3.6 billion. Metro also received FFGAs for Sections 1 and 2 of the Purple Line Extension — $1.25 and $1.1 billion, respectively. Section 3 will run for 2.56 miles from the Century City Station to two stations in Westwood — one at Wilshire and Westwood boulevards and the other in front of the Westwood VA Medical Center, just west of the 405 freeway. In Sept. 2018, the FTA also gave Metro the go-ahead to begin tunneling work on section 3. In addition, in Nov. 2018 the FTA allocated Metro the first $100 million of the FFGA . Again, in plain English, the FFGA is not a completely done deal yet but the FTA’s actions this week indicates the deal is progressing well. @FTA_DOT Shout out from CEO #PhilWashington to Acting Administrator Jane Williams who really helped out LA Metro and the ’28 Olympics with the Purple Line Section 3 LONP-$1.4 billion! Click map to see larger. 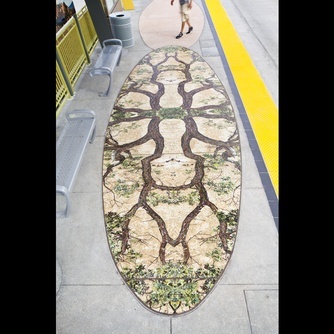 The Metro Board of Directors this month will consider moving a primarily street-running bus rapid transit line between North Hollywood and Pasadena into the project’s next phase, a formal Draft Environmental Impact Report (DEIR). 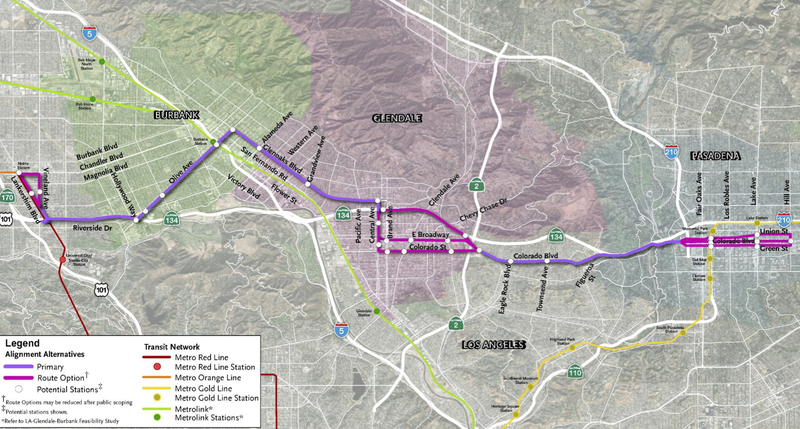 The bus rapid transit line would run for 18 miles between the Orange Line/Red Line station in North Hollywood and Pasadena City College in Pasadena with service to the Burbank Media District, downtown Burbank, downtown Glendale, the Eagle Rock business district and the Gold Line in Old Pasadena. A map of the project is above. As indicated, some sections of the project corridor include multiple route options, which will be studied as part of the DEIR. For those new to transportation jargon, bus rapid transit (often called BRT) is a high-quality bus service that provides faster and more frequent service with features that may include dedicated bus lanes, branded vehicles and stations, off-board fare collection and all-door boarding. Metro’s Orange and Silver Lines are both examples of BRT. Three routes for this project have been under study as part of an Alternatives Analysis: a street-running option, an option that mostly uses the 134 freeway and a hybrid street-freeway route. Metro staff has identified the street-running route as the most promising because it has the most public support and offers the most connectivity to jobs, housing and other destinations. This route is also projected to attract the most riders (up to an estimated 30,000 daily boardings) and help boost the development of transit-oriented communities . 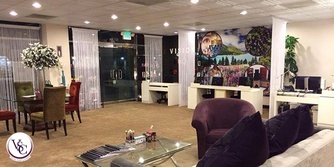 •The project is intended to be a key connection between the San Fernando Valley and San Gabriel Valley — a very heavily traveled corridor served only by Metro’s Line 501 between Old Pasadena and North Hollywood. The 501 operates primarily along the the SR 134 freeway. •End-to-end running times for the street-running route are estimated to be about 65 minutes. It’s worth noting that Metro found that the majority of trips entering the area served by this project are headed to destinations within that area. Only about one third of the trips are going through the entire project area from one end to the other. •The estimated cost of the street-running alternative is $271 million to $429 million. The cost will depend on the final project design. In addition to Measure M funding, this project will receive funding from the Senate Bill 1 gas tax and vehicle fees that became law in 2017. •The goal is to begin project construction in summer 2022 and open the project in summer 2024. •This is one of three Measure M bus rapid transit projects currently in the planning phase. The two others are a BRT line that would run on Vermont Avenue between Hollywood and 120th Street in South L.A. and the North San Fernando Valley Transit Corridor , an east-west line that would run across the northern San Fernando Valley. •The Metro Board will consider the item at their scheduled meeting next Thursday, April 25, at 9:30 a.m. at Metro headquarters in downtown L.A.
What do you think about the route for the NoHo to Pasadena project, Source readers? Comment please. The pilot will last two years, during which time both Metro and MobileQubes will see if this amenity proves popular among riders. Metro riders can rent a Qube for $4.99 for 24 hours (99 cents each day thereafter for up to one week) and take it with them throughout their daily journey. Once they are done charging, riders simply return the battery to any MobileQubes kiosk in the U.S. network. The battery will automatically be recharged and put back into inventory for other customers. MobileQubes was created after company founders became frustrated with dying phones and carrying charging cords around looking for an opportunity to squeeze a little more juice into their phone batteries. 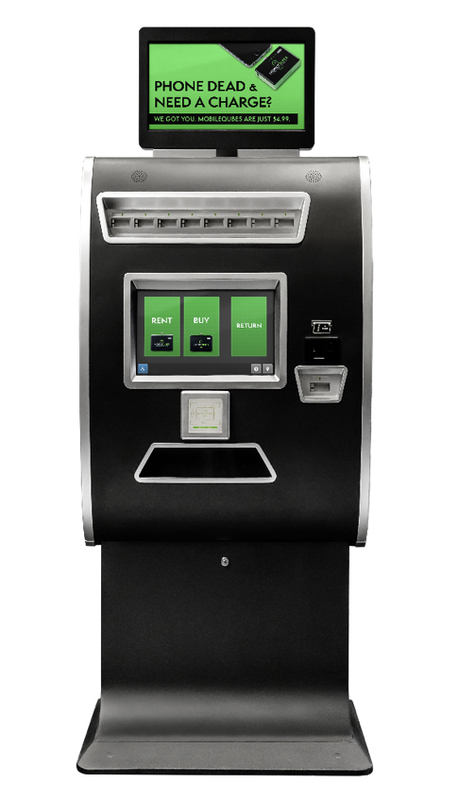 MobileQubes’ self-service, fully automated kiosks give smartphone users power where they need it — on-the-go and in their hands. No cords, no stopping, no problem. MobileQubes continues to grow its national network so other locations can be found on their website www.mobilequbes.com or on any kiosk by clicking the map icon. If you’re reading this whilst riding the Dodger Stadium Express , you don’t need to be told the Dodgers are going for the series sweep this afternoon. If the Reds’ relief corps and manager have anything to do with it, you might want to start looking for a broom. •The L.A. City Council voted 12-0 to oppose Senate Bill 50, which would pre-empt local zoning laws across California and allow denser housing to be built near frequent bus and rail lines, reports the LAT . Proponents say upping the amount of housing is critical in a state widely acknowledged to have a housing crisis — and putting new housing near transit is common sense. Opponents say the bill will lead to gentrification that will squeeze out low-income residents and that it will create more market-rate housing instead of the affordable housing so badly needed. What both sides are saying: that the bill would allow single-family homes to be replaced by multi-unit housing (with limits on size but also market rate in many instances) is making things challenging for this bill from a political point of view. It’s hard to say how the bill will fare in the Legislature but I think it’s safe to say it’s not exactly a mortal lock to pass. A similar bill died in the Leg last year. •Quasi-related: The city of Santa Monica plans to demolish a parking garage one block from the Third Street Promenade and replace it with housing for the homeless, reports the S.M. Daily Press . The Expo Line station is only a couple blocks distant but S.M. still gets pretty swamped from traffic — so it’s pretty incredible to see the city reduce existing parking. 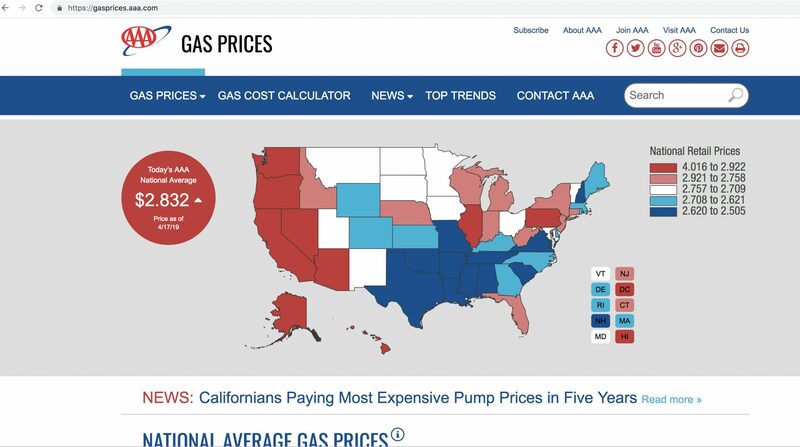 •Gas prices are averaging $4.01 across California today, so says AAA . That’s the highest since 2014 and likely because of ongoing or recent maintenance on six of 10 refineries that produce the special-blend gasoline used in the Golden State to combat smog (combating does not equal winning). Don’t like paying at the pump? Try riding Metro — a round-trip ride is just $3.50. •A great interactive story in the NYT looks at melting glaciers in the Pacific Northwest and Alaska and the scientists who are studying how downstream ecosystems will change. One idea floating around: there could actually be more habitat for salmon but less for other species. As we’ve said many times before, generally speaking taking transit instead of driving alone is a way to reduce greenhouse gas emissions that contribute to global warming. Or, to put it another way, take transit and help to try to save a glacier. This is one reason that Metro is offering free rides on Earth Day this Monday. 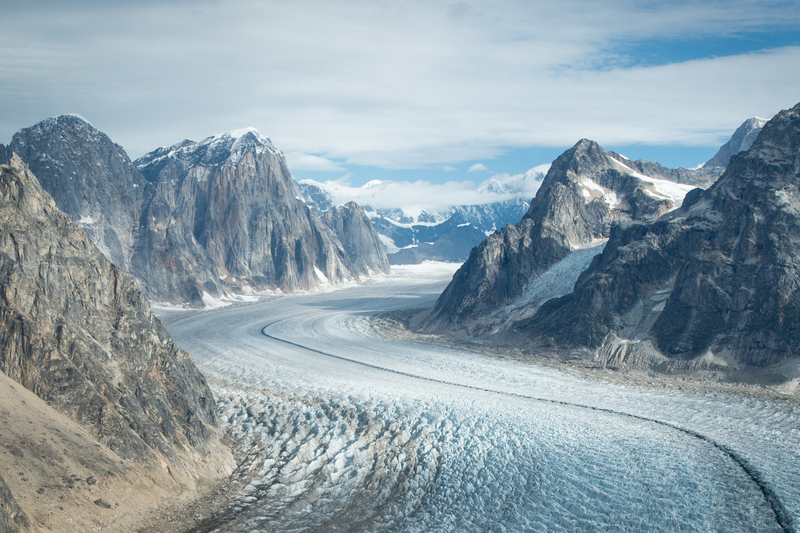 Aerial view of a glacier near Mt. Denali in Alaska. Credit: Getty Images. The Nisqually and Wilson glaciers on Mt. 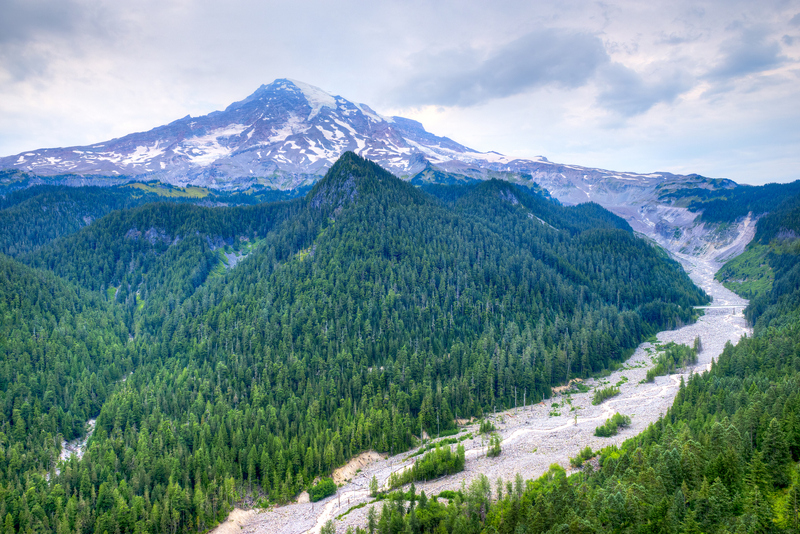 Rainier in Washington State. Credit: Getty Images.